We know them as drones. The authorities like to call them by their proper name: Unmanned Aircraft Systems or UAS. Flying civilian drones has really taken off in recent times—pun intended. The technology and growing availability of drones caught US authorities off guard. Until recently, they had no idea how to manage them. All they knew was that drone flying could not go on unregulated. In the meantime, folks continued to snap up drones online or from high-street stores and take to the skies. You still can, but new rules and regulations now dictate what you can fly and where  . 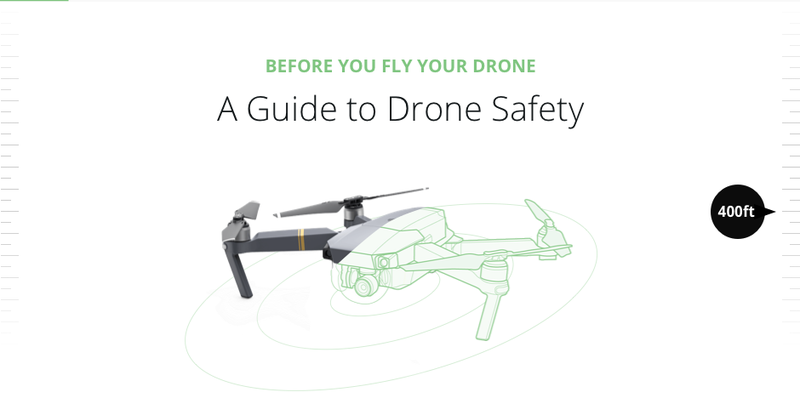 This guide gives you tips on how to stay safe while flying a drone. Always follow FAA rules while flying your drone and make sure that you obey local laws and regulations. This guide will be updated on occasion with new content, images, and embedded videos. This document does not purport to provide you with legal advice. Always consult an attorney if you need legal advice. 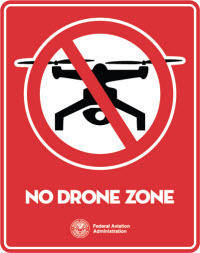 In the US, there are now tight regulations that drone owners must abide by at all times. Ignorance is no excuse in the eyes of the law. Failure to comply has serious consequences. We’ll get to those later. Shopping for new or used drones is a simple affair. Operating them in US skies is a whole other ball game. This is why you should take a few minutes out to read this easy-to-follow guide. The main focus of this piece is with recreational and business users. Public entities, i.e. fire services, law enforcement, government agencies, etc., will already be up to speed with their legal obligations. Public entities can fly under business drone rules if it works for them. Other departments will operate under a COA or Certificate of Authorization. The latter provides special flying privileges . They came together to form a public awareness program in partnership with the US Federal Aviation Administration (FAA). They call this simple educational campaign: Know Before You Fly. The idea behind the “Know Before You Fly” campaign is straightforward. The idea is to educate drone owners and prospective owners on safe, responsible flying of UAS in US skies. We wrote this guide to support their initiative of promoting public awareness of drone safety laws. Maximum flying altitude for UAS is 400 ft. above ground level (AGL). There are very specific rules about what constitutes a recreational drone operator. There can be serious consequences for anyone who ignores or breaks these rules now that they’re in the public domain. The authorities class small UAS—flown for pleasure purposes—as model aircraft. This means they come under the model aircraft rules, regulations, and safety guidelines as established by the US Congress. 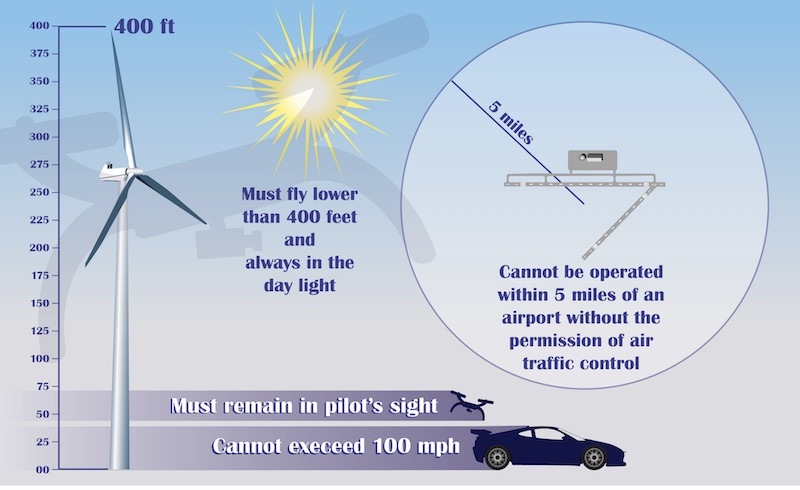 In the case of unmanned aircraft, small means any drone over 0.55 lbs. (250g), but less than 55 lbs. (25 kg). 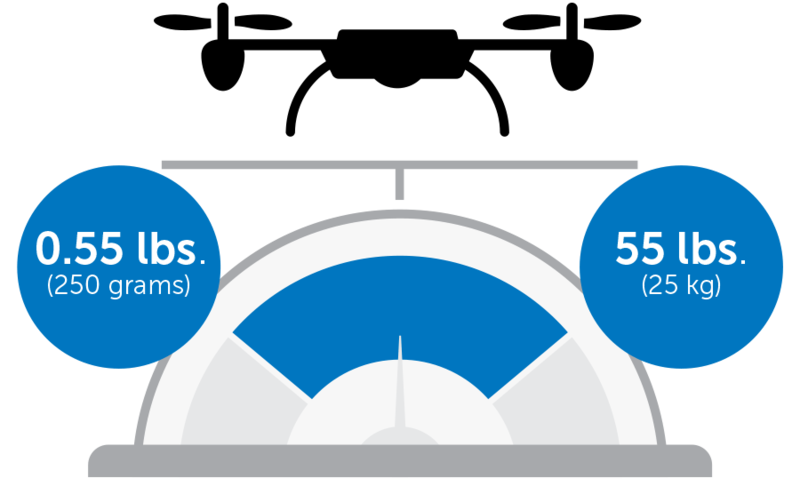 In other words, drones that are smaller than 0.55 lbs do not need to be registered and drones over 55 lbs are generally not allowed. Even though you don’t have to register small drones, you still must obey the FAA flight rules. We discuss these rules more below. In addition to federal laws, there may be state and local laws that you need to obey. Please make sure to look up information for your local jurisdiction. When you register, you have to state your usage is purely for recreational purposes on the registration form. You must affix your unique identification number to the aircraft. You can find this number after registering on the online confirmation screen of your user profile. Your unique identification number must be clearly visible or at least easily accessible. 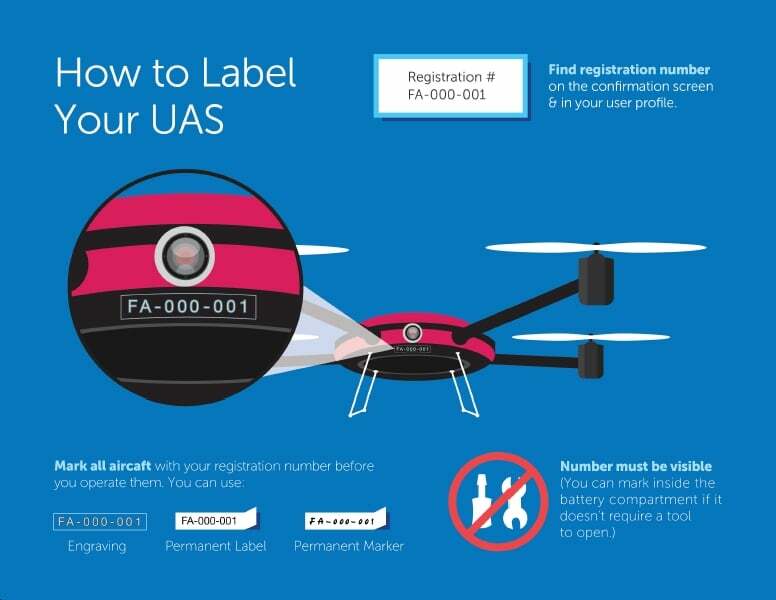 There are three ways to attach it to your drone: engraving, permanent label, or permanent marker . 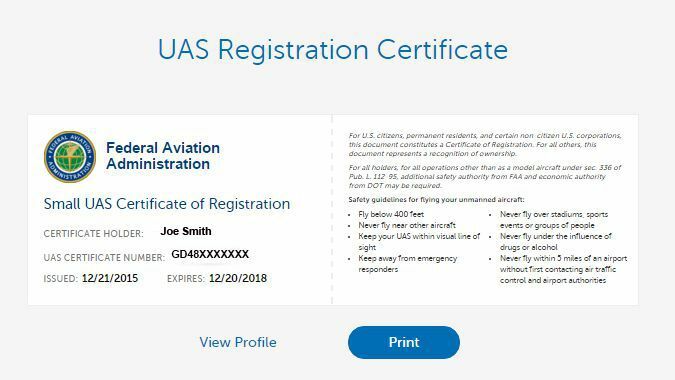 You’re ready to take to the skies as a recreational drone pilot once you’re fully registered. The sky is now yours, as long as it’s recreational and doesn’t interfere with other people, places or events. Remember to ALWAYS adhere to your legal limitations and restrictions. If you’re tempted to put your UAS registration on hold—think again. There can be serious consequences for those who fail to register their drone. Civil penalties can reach as much as $27,500. Under 18 U.S.C. 3571, there are even harsher consequences for criminal penalties. These can include hefty fines to the tune of $250,000 and/or incarceration for anything up to three years. Visitors to the US can legally fly drones and other types of small unmanned aircraft under the same guidelines as nationals. That means they also have to register their UAS on arrival . Registration for foreign nationals is the same easy online process. The registration serves as the “Certificate of Ownership“. It’s a simple yet necessary legal process. If you’re a recreational drone operator in the US, but unsure about your entitlements, refer back to the FAA guidelines for a refresher. They clearly state what constitutes flying for fun . Fly your drone at or below 400 ft. Flying drones—like flying kites—gets more exciting the higher you go. Alas, even if your drone has the ability to climb high, recreational drones cannot legally fly above 400 ft. from ground level in the US. Note that this is 400 ft. from above ground level (AGL), not surface level. That means you can’t launch a drone from the top of a 30 story tower block and climb 400 ft. from the launch area. If you’re wondering how you can monitor the altitude of your UAS, the FAA has something to say on the matter. 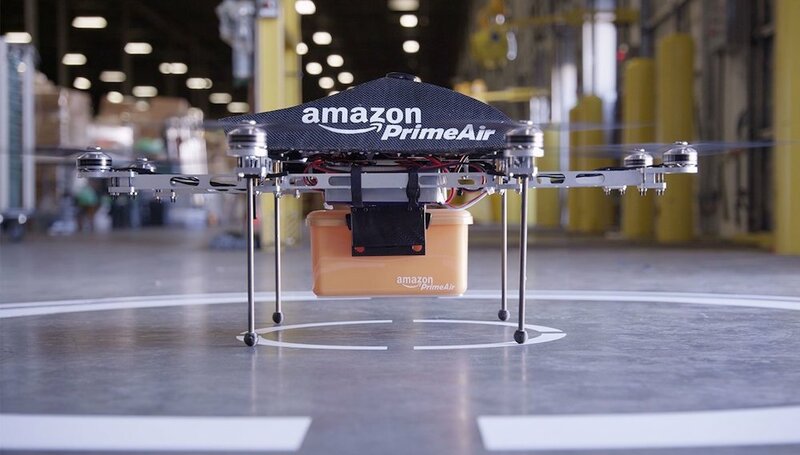 They suggest that when you lose sight of a drone it’s probably higher than 400 ft.
You’ve probably heard about Amazon’s FAA-approved Prime Air program. The company’s thinking about exploiting drones to deliver their products to customers. It’s a pretty neat initiative. But even at the commercial level, Amazon will still have to comply with the 400 ft. altitude rule. They also have to abide by UAS speed restrictions, currently capped at 100 mph. The vice president of Amazon’s Global Public Policy is not a happy chap. He thinks the current FAA drone regulations are too strict toward their company ambitions . Hobbyist Flies Drone to 11,000 Ft.
A UAS hobbyist from Europe flew his DJI Phantom 2 drone to a record altitude of 11,000 ft. He not only broke a record he also broke the law. Don’t ever try this at home or from home turf. Safety and security regulations for civilian drones are in place for good reasons. Failure to comply with these regulations could result in a catastrophic incident. The thrill is never worth the gamble. People often travel with their UAS at home or overseas. Always know how the rules apply to you and your situation wherever you are and however you plan to fly . There are two kinds of recreational drone flying in the National Airspace System (NAS). Which rules and regulations you follow depends on what you plan to do. The most hassle-free option is to simply fly your UAS in direct accordance with the official “Special Rule for Model Aircraft” (Public Law 112-95 Section 336). The other option is to fly in direct accordance with the FAA’s Small UAS Rule (Part 107). This option gives the same choices as commercial drone pilots but most recreational operators don’t need it. As much fun as drone flying is, not everyone wants a UAS for recreational use. There are specific guidelines and safety regulations for flying commercial UAS that weigh less than 55lbs . The list could go on, but you get the general idea. The above examples involve flying drones for profits not for pleasure. The FAA’s ruling on commercial drones went into effect on August 29, 2016. It’s the responsibility of all businesses and independent professionals to abide by these regulations. Operating UAS for commercial purposes has a different set of rules and regulations than recreational flying. In the US we refer to this as flying under “the small UAS rule” (14 CFR part 107). Because technology and demands are continually changing with UAS, rules, regulations, and commercial drone pilot prerequisites may also change. Always check with the official bodies for updates on remote pilot certification . Aircraft must weigh less than 55 lbs. There are some similarities with non-commercial operation rules but also a few exceptions. If you’re a remote commercial drone pilot you MUST fully understand and comply with these rules. That’s the basics covered on types of drone flying rules and regulations. Public safety has to come first above all else. Just because a piece of sky looks clear and empty that doesn’t always mean it’s safe to fly in that space. So how can you know the safe spaces to fly? If you’re mobile a lot you’ll always be on the lookout for new places to fly your UAS. Those into aerial photography and video will want to know the flying conditions before they take to the skies. There’s good news. The guys at FAA have developed a special mobile app they call B4UFLY . 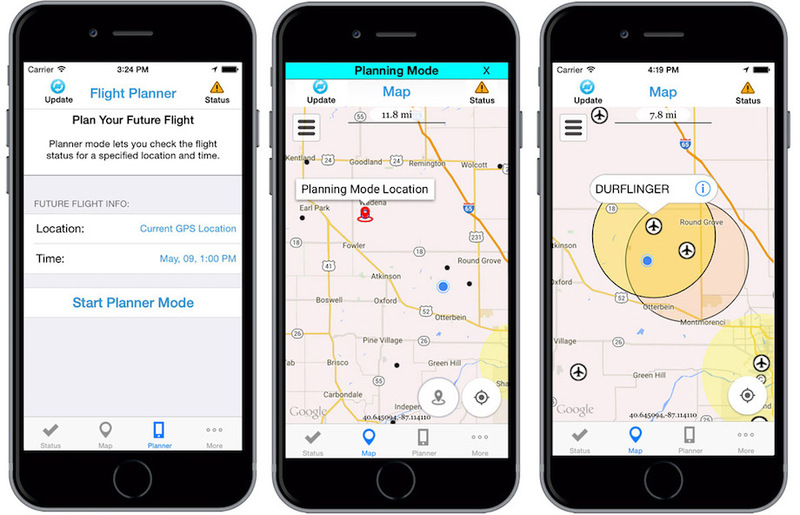 This handy little app exists to inform UAS operators of local conditions. It tells you if there are any special requirements or restrictions for flying in the area. You can download the B4UFLY smartphone app for free at the Google Play store (Android) or at the App Store (iOS). It’s incredibly simple to use and informative. You really don’t want to be without it. There’re three B4UFLY flight-status indicators: red orange and yellow. Local laws and regulations drive these indicators. They’re invaluable as they help drone pilots to make informed decisions . Sometimes you might want to take photographs or record video within five miles of an airport. It is possible to fly within these zones but not without prior permission. Even if you contact the airport, they are still within their rights to deny you the air space to operate. However, they’re only likely to do this if they think your UAS possess a potential risk. Requests within a five mile zone apply to sea-based airports and heliports as well as regular airports. You don’t need to contact anyone if you operate outside the five mile zone of these places . Almost 70% of the US population lives within 20 miles of one of the country’s 30 major airports. In total, the US has somewhere in the neighborhood of 13,000 airports of various sizes. There’s a good chance that most flyers of UAS live or work within a few miles of one of these airports. Some of you may not even be aware of it. This is why drone pilots need to know their skies. Exactly where do you intend to fly your drone (latitude/longitude or an address)? What kind of flying activity are you planning? How many UAS are you using? What is the description of the UAS? What day, date, and time will you be flying and for how long exactly? It sounds like a lot of fuss but this is safety so it’s important. It won’t take more than a couple of minutes as long as you have your answers prepared in advance. Drone pilots can—and sometimes do—have accidents as a direct result of flying their UAS. There have been several high-profile drone accidents reported in the US, over the years. The more accidents there are, the stricter the unmanned aircraft regulations are likely to get. A lot of these incidents happened because of pilot error, ignorance, or mechanical failure. The latest report into drone incidents is from August 2015 to Jan 2016. There were a total of 582 incidents. Unfortunately, this figure is set to rise as more unmanned aircraft take to the skies. Over 30% of all incidents were potential hazards or close encounters. 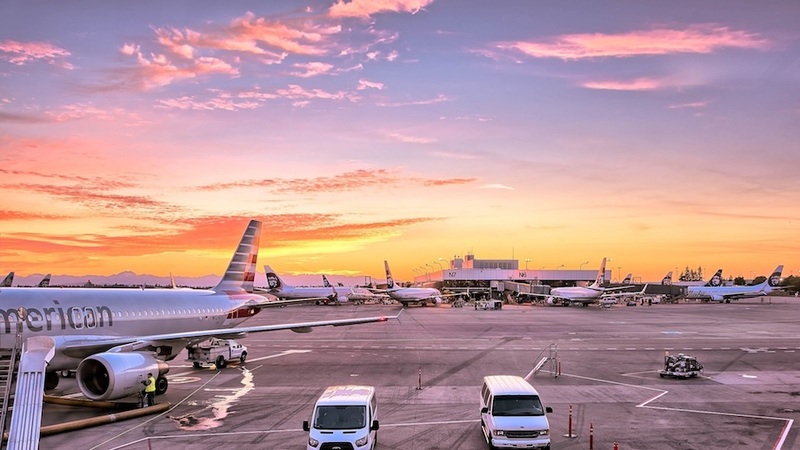 Three out of every five incidents took place within five miles of airports. Nine out of ten incidents happened at over 400 ft.
You can see the potential problems civilian drones can have if operators don’t adhere to the guidelines. There were 24 incidents where UAS’ came as close as 50 feet of manned aircrafts. In 11 cases, human pilots had to make evasive maneuvers to avoid the drone. On average, one third of all drone incidents concerned multi-engine jet airplanes . It’s not only a US problem either. In the UK, reports of drone incidents soared by a staggering 352% in a single year. Needless to say the UK authorities are calling for newer, stricter regulations . Accidents are incidents that never had to happen, at least in a lot of cases. This is why drone operators MUST abide by the rules and regulations. It’s the only way to enjoy this new technology in safety. Some drone accidents and near encounters are caused by pilot mistakes. Others will be the results of technical problems rather than operator error. Sometimes it will be a combination of the two. It’s a particular problem when a drone operator loses radio connection with the aircraft. In these cases it’s inevitable that the drone will eventually crash. According to Dr Graham Wild from Australia’s RMIT University’s School of Engineering, crashing drones have the potential to kill a person . Drones are here to stay. The way we use them and the advancements in technology are going to make them even more versatile, practical, and fun in the years to come. 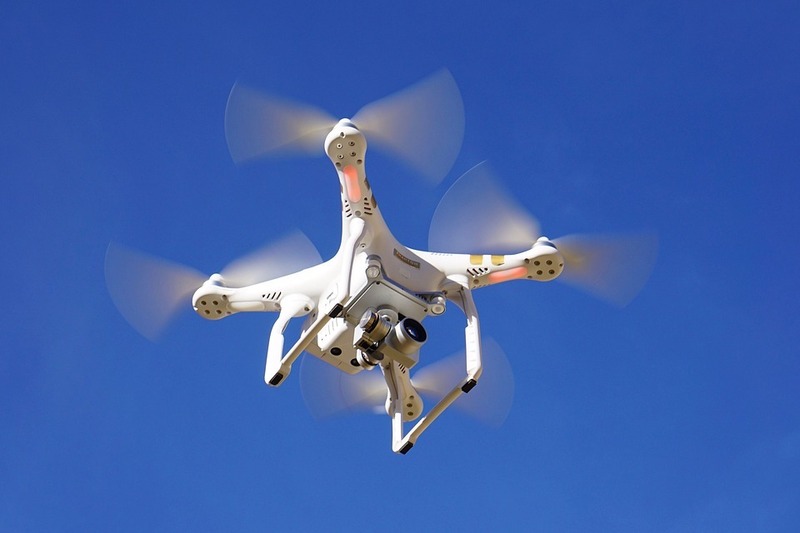 The Federal Aviation Administration (FAA) along with the AUVSI and AMA continue to look at civilian drone safety, regulations, and safer practices. For all the latest updates visit the FFA FAQ page. 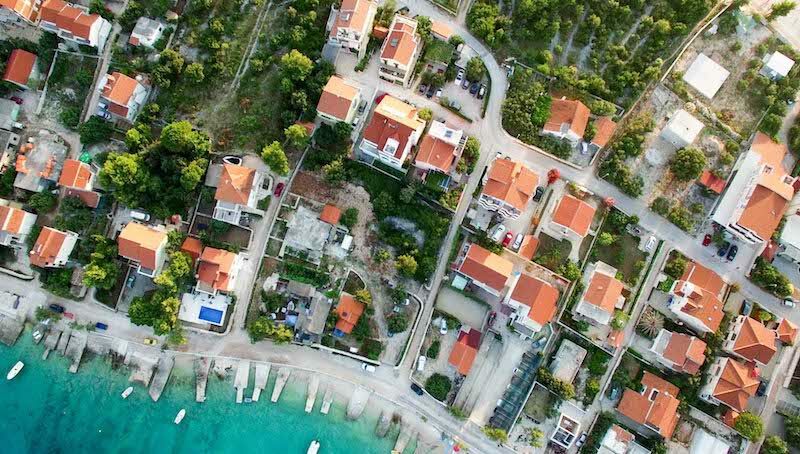 As long as you operate your UAS in accordance with state rules and regulations, you can look forward to as much safe flying as you need or want to do. Register aircraft between 0.55 lbs. up to 55 lbs.